(314) 997-2301 map! 9200 OLIVE BLVD. This bad boy of the brisket sandwich world is served with brisket (of course), smoked sausage, horseradish sauce, BBQ sauce, lettuce, pickles. The perfect sandwich for someone who likes a lot of sandwich. The "P" stands for "Pretty Darn Delicious" or "Pimento Cheese." Depends who you ask. Check out the most plentiful BLT you've ever had with pimento cheese, house bacon, lettuce, tomato, on toasted bread. This is cheesesteak our style. This Philly-inspired sandwich with an east-coast attitude is served with brisket with onions, peppers, and cheese on a hoagie roll. This simple and sumptuous sandwich is served with a choice of your favorite meat and coleslaw. 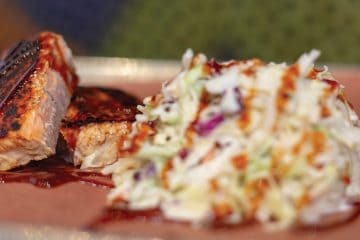 We top it with a drizzle of our eastern-inspired Mustard Barbecue Sauce for the mid-south tang you're looking for. If you're just looking for something simple and straightforward, this is for you. 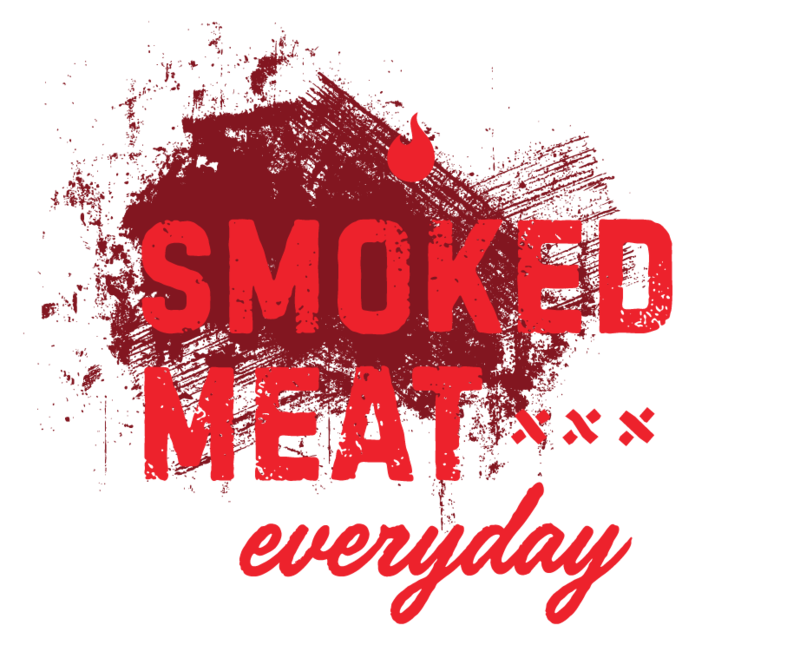 Our specialty barbecue plate with your choice of any 2 smoked meats and 2 sides. This one comes with a fountain soda to wash down with your fav 'cue sauce. This plate of all plates is not for the faint of heart. Take a look at a 4-bone rib, jalapeno cheddar sausage link, & 4oz each of brisket, pulled pork, turkey. Plus 2 sides and a fountain drink to top it all off. Bone appetit! This predecessor to the meat daddy is plenty for most. On this one, select 3 of your favorite smoked meats, and add 2 sides and a refreshing fountain beverage. Nap time not included. Don't tell anyone, but we snuck something on here for our veggie-friendly friends. This is a double-decker smoked portabella sandwich with special sauce, lettuce, balsamic onions, pickles, and American cheese. Grab a 6oz. or 8oz. helping of our famous pulled pork and pair it with your two favorite sides and a crisp fountain soda. Top this with with something from our range of sauces for a flavor-balanced meal. Just looking for a light meal, or maybe even a side dish to be added to your breakfast lunch or dinner? 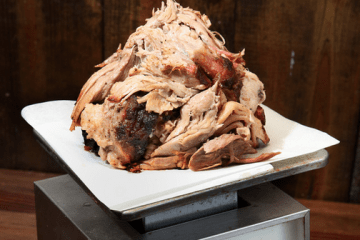 We offer servings of pork by its lonesome in portions of 4oz., 1/2lb., or 1lb. We serve pulled pork in 6oz. or 8oz. portions on a freshly baked bun. This plate comes with one of your favorite sides. 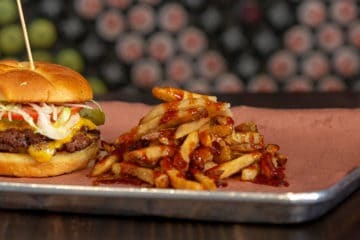 Top with one of our tasty barbecue sauces to round it out. Grab a 6oz. or 8oz. helping of our famous smoked brisket and pair it with your two favorite sides and a crisp fountain soda. Top this with something from our range of sauces for a flavor-balanced meal. Just looking for a light meal, or maybe even a side dish to be added to your breakfast lunch or dinner? 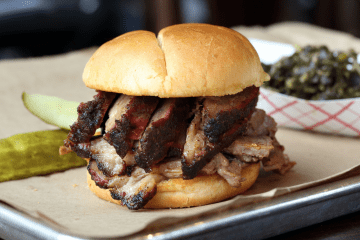 We offer servings of brisket by its lonesome in portions of 4oz., 1/2lb., or 1lb. We serve brisket in 6oz. or 8oz. portions on a freshly baked bun. This plate comes with one of your favorite sides. Top with one of our tasty barbecue sauces to round it out. 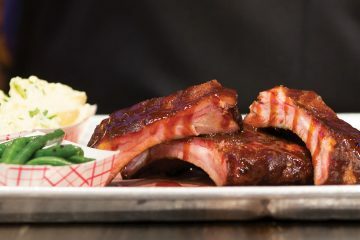 Grab a 1/2-rack (6-bone) or full-rack (12-bone) helping of our famous house-smoked ribs and pair it with your two favorite sides and a crisp fountain soda. Top this with with something from our range of sauces for a flavor-balanced meal. Looking for something lighter? Grab a 1/3-rack (4-bone) of our famous house-smoked ribs and pair it with your favorite side and a crisp fountain soda. Top this with with something from our range of sauces for a flavor-balanced meal. 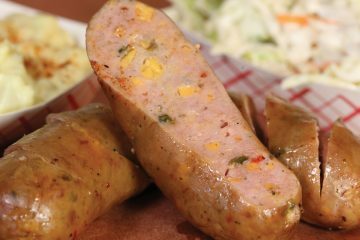 This house recipe of jalapeño and cheddar mixed straight into a perfectly wrapped sausage link is the perfect pairing for the rest of your meal. Keep a tall glass of cold fountain soda nearby. We didn't hold anything back on this spicy link of all links. Grab a 6oz. or 8oz. 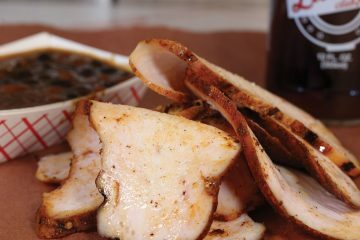 helping of our famous smoked turkey and pair it with your two favorite sides and a crisp fountain soda. Top this with with something from our range of sauces for a flavor-balanced meal. We serve turkey in 6oz. or 8oz. portions on a freshly baked bun. This plate comes with one of your favorite sides. 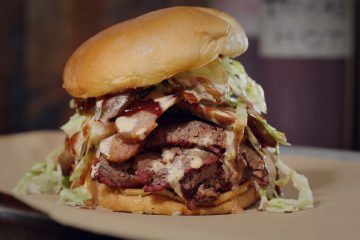 Top with one of our tasty barbecue sauces to round it out. This double-pattied burger is served with one side. Grass fed beef blended daily from our proprietary mix of chuck, brisket and boneless short rib, hand-patted and griddle seared, seasoned only in sea salt and fresh cracked pepper then served on a real butter toasted bun. Add lettuce, tomato, pickles, onions, and house condiments at your request. This solo-pattied single is grass fed beef blended daily from our proprietary mix of chuck, brisket and boneless short rib, hand-patted and griddle seared, seasoned only in sea salt and fresh cracked pepper then served on a real butter toasted bun. Add lettuce, tomato, pickles, onions, and house condiments at your request. Grab a 5oz. helping of our famous smoked salmon and pair it with your two favorite sides and a crisp fountain soda. Top this with with something from our range of sauces for a flavor-balanced meal. Just looking for a light meal, or maybe even a side dish to be added to your breakfast lunch or dinner? We offer servings of salmon by its lonesome in 5oz portions. This one doesn't come with any sides. We serve smoked salmon in a 5oz. portion on a freshly baked bun. This plate comes with one of your favorite sides. Top with one of our tasty barbecue sauces to round it out. Our take on this traditional salad is served with romaine lettuce, creamy caesar dressing and topped with a heaping helping of our daily house-smoked chicken, a splash of freshly grated parmesan cheese and house-made croutons. 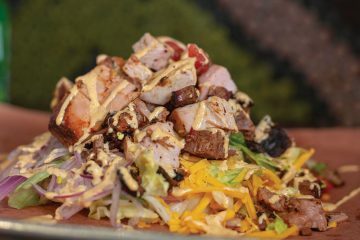 This meat-full meal in a salad is brought to you by field greens and topped with brisket, turkey, a hard boiled farm egg, tomato, cucumber, cheddar cheese, red onion, lettuce, ranch dressing or cider vinaigrette. Oh, we sure did! This baseball game-inspired treat has been prepared with spinach, red onions, pit ham, bleu cheese, Cracker Jacks™, and an apple cider vinaigrette. Once you try it, it will be a homerun for your taste buds. Adventurous 'cue eaters will love our Alabama-style white sauce, which gets a kick from just the right amount of horseradish and vinegar. Fantastic on brisket or right out of the bottle. Yum. There's something special about this sweet, complex sauce. Something indescribable. It's an enigma, just like its name. No one knows what the 47 stands for, not even us. In the wild, honey badgers are known for being tenacious. This sweet, tangy sauce will grab you and won't let go until you've poured it over everything in sight. 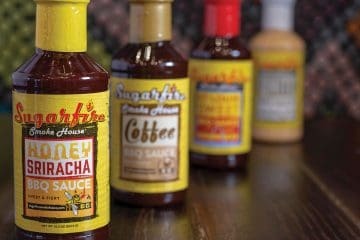 This perfectly balanced sauce brings just the right amount of sugar to pulled pork, brisket, or a full rack of ribs. Lick your fingers after you're finished. You don't want to leave a drop of this behind. For folks who like a little more tang in their sauce, our classic Carolina sauce combines yellow mustard and vinegar for a double dose of flavor. The temperature is always climbing in the Lone Star State, and so is the heat in this sauce. Our peppery, smooth sauce brings a deep Texas flavor to anything you put it on. This starter or side can be shared or kept to yourself. 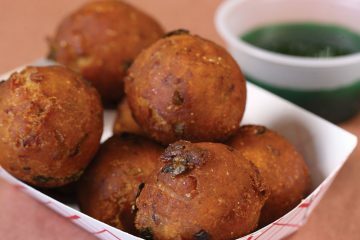 House-made hushpuppies, breaded and stuffed with pork belly and served with a jalapeño jelly for dipping. Once you make these part of your Sugarfire schedule, it'll be hard to leave them out. They start fresh and then wind up house-smoked. These artichokes are served alongside a zesty lemon aioli for dipping capabilities. Perfect for sharing before the meal, or keeping to yourself on the side. This hot, hand-cut potato delight is prepared with love daily. Our french fries are the perfect side to your meat-ful meal. Served in single servings, by the quart (usually for 4-6 people) or by the gallon (usually for 15-20 people). This hot, spicy, side is prepared with love daily. Our tangy baked beans are the perfect side to your meat-ful meal. Served in single servings, by the quart (usually for 4-6 people) or by the gallon (usually for 15-20 people). This cool cabbage treat is prepared with love daily. 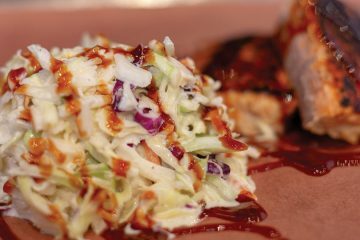 Our mayo-based coleslaw is the perfect side to your meat-ful meal. Served in single servings, by the quart (usually for 4-6 people) or by the gallon (usually for 15-20 people). This cool potato treat is prepared with love daily. Our mayo-based potato salad is the perfect side to your meat-ful meal. Served in single servings, by the quart (usually for 4-6 people) or by the gallon (usually for 15-20 people). Scoops of local, handmade ice cream in a glass, topped with local soda, or "pop" if that's where you are. These floaty delights are served in varieties of purple cow, root beer, or orange. Or, just ask us for some ice cream and top it with your favorite soft drink! It might just be exactly what it sounds like. 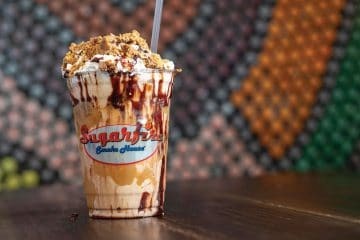 A full piece of pie blended directly into one of our housemade milk shakes. Choose your pie and choose your shake flavor and see them come together in holy moo-trimony right in front of your eyes. Choose your favorite classic flavor from our selection of chocolate, vanilla, or strawberry. Topped with whipped cream and other fun stuff! Our housemade shakes are always made with fresh ice cream. Brain freeze insurance not necessarily included. These grown-up shakes are for our 21 and up crowd only, and they are the perfect cool pairing to your smoky, sweet, or spicy meal. Served in varieties of chocolate peanut butter bourbon, white russian, or vanilla caramel bourbon. You've earned it. Pair your favorite delicious barbecue meal with a local or macro brew of your choice. 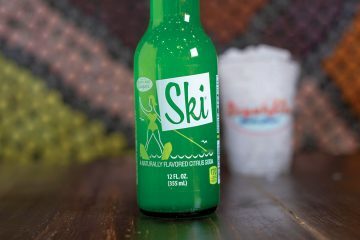 Check out your local Sugarfire for a current list of frosty brews! Beers are for dining in only. Thanks to our brewery partners for providing these crispy 'cue-quenchers. We take pride in sourcing local soda pop and also offer a selection of sweetened and unsweetened iced tea. Thanks to our local partners for being a part of our dining experience in each and every Sugarfire city. Cheers to you! why risk it? go with brisket.